Today I finally decided to address the absolutely healthiest of all health foods – chocolate. Seriously if you believe some of the articles on the subject of chocolate, you’d give up on vegetables, fruit, whole grains, nuts, beans and fish and eat chocolate instead. I’m not talking cocoa, but the creamy chocolate candy with fat and sugar included. Color me a little cynical when I read some of the candy companies’ words as related to chocolate, “Phytonutrients that have been shown to help support healthy circulation.” Yes, their statements are based upon studies and the studies are on the flavonols in cocoa. Cocoa is a plant food, so that’s a good thing, but be sure to realize what else is inside the wrapper (sugar and fat). A chocolate bar is not a food that you should consider replacing your balanced dinner with. The European Heart Journal reporting the work of German researchers say that a little dark chocolate may be good for your heart and blood vessels. (Notice the word ‘little’ in the preceding sentence.) The researchers followed 19,357 people, ages 35 to 65 at the beginning of the study; those consuming the most dark chocolate had lower blood pressure on average and were 39% less likely to suffer a heart attack or stroke, compared with the lowest chocolate consumers. I believe it is really worth pointing out that those consuming the most chocolate were only eating about a quarter-ounce a day. Evidently, the flavonols in chocolate help the cells lining blood vessels to absorb nitric oxide, which in turn relaxes and widens the blood vessels and improves platelet function. This biochemical action essentially appears to lower cardiovascular disease, at least in part by lowering blood pressure. The results seem to be a little stronger for reduction of stroke than for heart attacks, but either way the candy companies are revving up production. The last Dr. Grandma’s Blog was about Not Sacrificing the Joy of Sweets, Nor Health; it was essentially about using Dr. Grandma’s Delight, our zero-calorie all-natural sweetener made with erythritol and fruit extracts. It really is a lifesaver (possibly an exaggeration); in sweetening yogurt, cereals, muffins, pancakes, coffee, tea and lemonade to name a few. But today, in writing about chocolate, I’m a bit torn. I’ve told you in past posts that I enjoy chocolate; what I haven’t told you is that chocolate is just one of those personal preferences, and not an obsession. If I want a little indulgence, and I do want chocolate in my life; I want it to be delicious. But I want to keep the portion size within strict limits. I don’t need a pound, or even an ounce (28 grams). Actually, 10 grams, (about a third of an ounce) will tickle my taste buds and psyche and let me move on to something else. You might be curious how I know the number of grams that will do the job. It goes like this: One of my very favorite chocolate candies is Lindt’s Dark Intense Orange. The package tells me that 4 squares are 190 calories (about 47 calories per square); the square has 6 grams of carbohydrate; four of those 6 grams are sugars and 3 grams are fat. Sugar is the first ingredient on the ingredient list; so I know that the candy has more sugar than any thing else. I don’t want that information to damage my enjoyment. If I’m striving to stick to The American Heart Association’s goal of 100 calories of sugar per day (see Have Your Cake and Eat It Too), that would be 16 calories of sugar; that’s almost exactly the amount of sugar in one square of Lindt’s Dark Intense Orange. The calculation is 4.25 grams of sugar per square; and 4.25 g times 4 calories per gram of carbohydrate, equals 17 calories. Therefore, I indulge my desire for a little treat, my taste buds are happy and my genetic predisposition for early heart disease is not getting an over supply of sugar or fat. 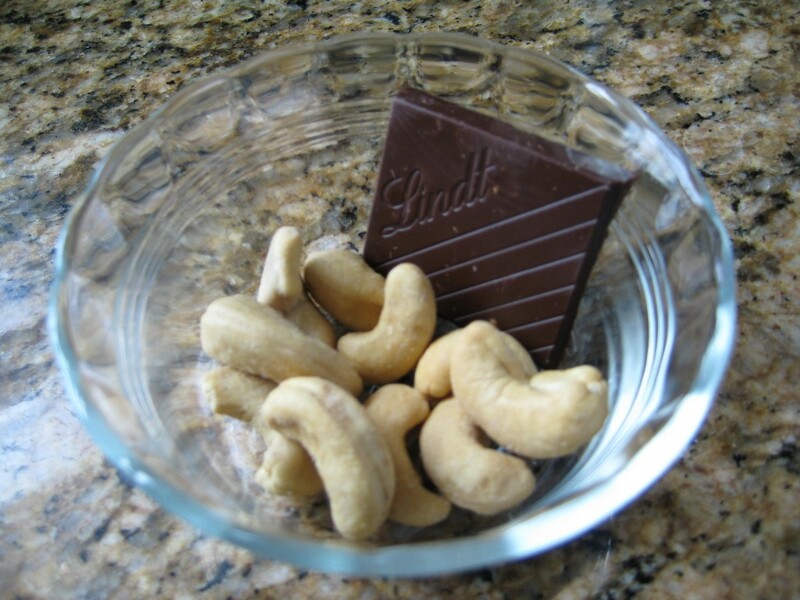 The square of chocolate and some nuts is a frequent bedtime snack – just enough to feel treated and to nip hunger. If you’re thinking, ‘Good grief, if I can’t eat the entire candy bar, it’s just not worth it,’ then I say, “Only you, of course, can make your own rules to keep yourself healthy.” A 475-calorie treat cannot frequently fit into my regular eating plan; that would be 47.5 pounds of weight gain, if I did that every day for a year – that or some other equally caloric extra. Yikes! That would not be at all healthy for me. I was thinking about what size spoon, Julie Andrews was singing about in the 1964 movie, Mary Poppins. I just watched the You Tube video of Julie Andrews singing A Spoon Full of Sugar. It planted many ‘seeds of thought.’ One is the Pollyanna (optimistic outlook) of Mary Poppins. Probably all of us are far more cynical than we were in 1964 (for those of you who were actually born by that time.) Another thought comes from the two children in the clip, standing quietly listening to Mary Poppins sing; that fascinated me. When was the last time I saw such a vision? Of course, I don’t remember all my dreams. But while I watched the little clip, the third thought was envisioning the spoon that would hold the average sugar intake for an American today – just about ½ cup. That’s a big spoon to swallow. Just a spoonful of sugar (small, like a teaspoon or less) or one square of chocolate can make life more enjoyable. Portion control is a skill that we may want to seriously consider developing. There are many foods that are sugary, fatty, salty and maybe just not nourishing. If you really enjoy them, would a small amount make your mouth taste good and your brain spell enjoyment? I believe in the adage that the first bite really tastes the best. Can portion control work for you with chocolate, whether or not it is the healthiest of all foods? I really desire to know how many of you think portion control is possible for you, and how many believe that your craving is just too intense. Soon our new website release will permit that discussion, but meanwhile we only have the comment function. I would love to hear from you. Please give portion control a try. A spoonful of chocolate can really be a part of good health being yummy. It just requires a recognition that too much of a good thing has very serious consequences, and for some, learning methods of control where the craving has grown too large. A delicious dessert within one dietitian's health parameters.